With removable three legged stand base to transform the monopod into a tripod. Quick release leg locks for adjustable height between 20.6″ (52.5cm) to 63″ (160cm). Bubble level for fine adjustment. Non-slip screw in rubber foot easily removable to attach the hydraulic foldable stand. Lightweight, robust and compact, this easy-to-use monopod is the ideal addition to your camera equipment. Perfect in tight space or crowd, the monopod does not take up much room and is easier to carry around than a full size tripod. 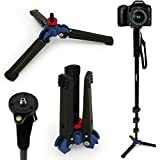 Although this does not convert your monopod to a fully functioning tripod, the three legged stand provide extra stability to your monopod to help reduce camera shake. High strength metal and non-slip, wear-resistant rubber to provide extra stability. Supports 360 degree rotation and tilting to better meet your shooting needs. The padded foam grip and rubber foot help maintain a solid grip on the monopod, and the wrist strap provides extra security whilst hiking or climbing. With four section aluminium legs that can extend from 52cm to 160cm in no time, you can be assured that you won’t miss your shot! The fortified constructed aluminium tubes ensure additional stability for a creative and enjoyable shooting experience. Supplied with a carrying case for easy transportation.